You can control how people who will be using a particular Mac log in. 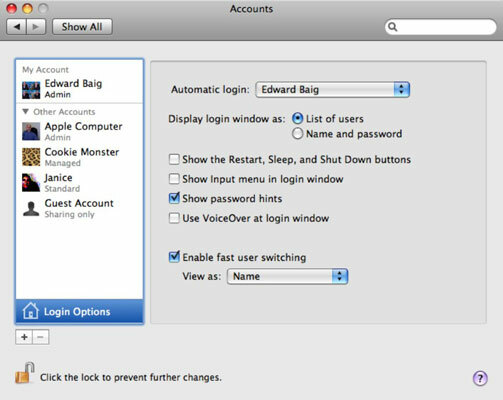 To log in, go to System Preferences, choose Accounts Preferences, and then click Login Options at the bottom of the left pane, under the list of all the account holders on your system. If need be, click the padlock and enter a name and administrative password. Once in, you’ll see the window shown in this figure. To automatically log in a particular user (likely yourself), select the Automatic Login option and choose the appropriate person from the pop-up menu. You’ll have to enter a password. If the computer is set to automatically log you in, any user who restarts the Mac in your absence will have access to your account. If automatic log in isn’t turned on, users who start up the Mac will encounter the computer’s Login screen. It will appear differently depending on which radio button you chose under Display Login Window As under Login Options. Select List of Users to see a Login screen with a roster of people alongside pictures for their respective accounts. Select Name and Password, and account holders must type a user name and password in the appropriate boxes on the Login screen. Either way, press Enter or click after entering the password to actually log in. If you type the wrong password, the entire window wobbles. Type it wrong a few more times, and any password hints you previously entered appear (provided you chose that option under Login Options).